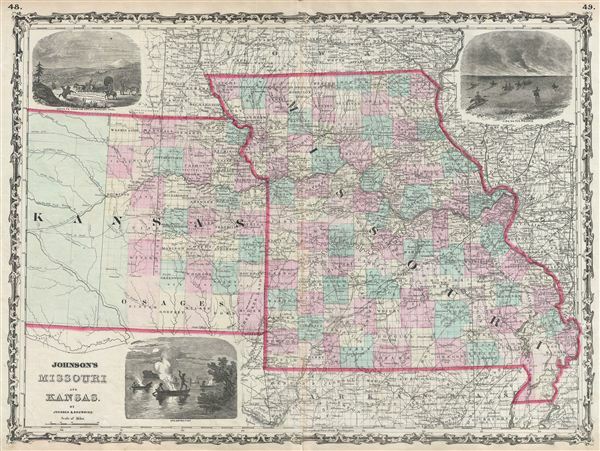 A beautiful example of A. J. Johnson's 1861 map of Missouri and Kansas. One of Johnson's more decorative maps, this rare map offers a fascinating snapshot of these hotly contested states shortly following the outbreak of the American Civil War. Map shows all three states in full with color coding according to county. Offers three inset woodcuts: 'Fire on the Prairie,' 'Santa Fe From the Great Missouri Trail' and American Indians 'Spearing Fish' at night from river canoes. Depicts the two states in an early configuration with western Kansas largely unsurveyed. Notes important transcontinental routes such as the Santa Fe Road and the proposed route of the Pacific Railroad. Features the strapwork style border common to Johnson's atlas work from 1860 to 1863. Published by A. J. Johnson and Browning as plate numbers 48-49 in the 1861 edition of Johnson's New Illustrated Family Atlas. This is the last edition of the Johnson Atlas to bear the 'Johnson and Browning' imprint. Subsequent editions reflect Ward's 1862 acquisition Ross C. Browning's shares in the firm. Very Good. Minor discolorations restricted to margins. Blank on verso. Original centerfold.